Hi, this is O. again taking a little bit of Jenn's Chocolate Shavings space for my Speedy Stir Fry Series. Despite all the syrupy, sickly sweet concoctions served at many chinese takeout joints, I still enjoy the addition of a sweet element to a stir fry. 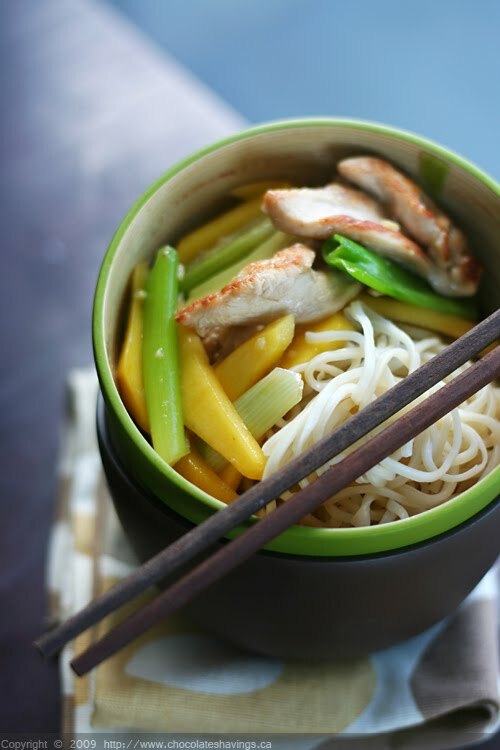 This Mango and Chicken Stir fry follows a basic quick and simple technique, with some added finely sliced mango. It really brings this simple dish over the top. I find that it makes a perfect end of summer lunch. 5 green onions, cut in half lengthwise, then into 2 inch pieces. Mix together the marinade ingredients, making sure to dissolve the corn starch. Slice the chicken into bite sized cubes or strips and add to the marinade. In a separate bowl, mix together the sauce ingredients. Prepare your garlic, ginger, green onions, and mango and reserve. Heat your wok until it begins to smoke. Add the cooking oil. I sometimes like to add a big chunk of leftover ginger to flavor the oil, but this is optional. Add the chicken and marinade mixture to the wok, spreading it evenly. Let it sear for 30-45 seconds without mixing. Add the garlic and ginger over top and stir fry for 1-2 minutes. Add the green onions and sauce and stir fry for another 2-3 minutes until the chicken is just cooked through. Add the strips of mango, stir a couple times and serve immediately with rice or noodles. Enjoy! yum - love simple stirfries! Simple, healthy and delicious. I love stir fry's and I love that photo too! For me this is what Fast Food should look like!!! all the mangoes are gone! and this looks like a lip smacking good dish. What a great stir fry with so many lovely colors. I too am not a fan of the gloppy goopy chinese food so commonly found in restaurants. This recipe looks like the perfect way to enjoy such perfectly combined flavors. Love the mango. I think this is gorgeous. Straight to the point and full of flavour. I am not a massive fan of too much gelatinous food, so this is perfect. yum, that looks delicious. I am so in love with the flavors of fall! Looks so delicious and simple! I love a touch of sweet and mango sounds like the perfect compliment to this dish. I can't wait to try it! Very nice... you got all your major food groups (as well as the main course and dessert) in the same dish! This is one of my new favorite recipes!! Delicious and simple! I served this over rice noodles - I think in the future I will make some extra sauce as the noodles were a tad dry. SO GOOD!